The Trenchless Technology Center has announced details for its second annual Auger Boring School to be held Oct. 3-7 at the National Trenchless Technology Research Facility at Louisiana Tech University in Ruston, LA. 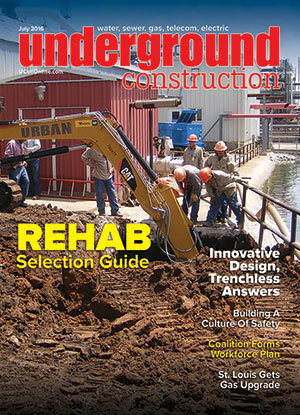 The school is being sponsored by Underground Construction magazine, American Auger..
Long, deep directional drills beneath bodies of water are challenging for horizontal directional drilling (HDD) contractors with the equipment and personnel able to perform this type of work, and each project has elements that set it apart from others. Bobcat Contracting LLC recently installed 18,0..
Like many utilities operating in urban areas, The Laclede Group is faced with aging infrastructure. The company is tackling this challenge head-on by undertaking a major upgrade to natural gas distribution systems operated by its three subsidiaries: Laclede Gas in St. Louis, MO, Gas Energy in Kansas..
by Jeff Griffin Senior Editor Working in construction carries potential dangers, and the level of danger varies with the type of work being performed – certainly underground construction poses risks specific to that industry. No one wants to get hurt, and owners and managers of construction firms .. The Distribution Contractors Association (DCA) and American Gas Association (AGA) recently held the Third Annual DCA/AGA workshop in Chicago. The workshop has grown in interest, attendance and in the range of issues addressed by a host of panels and speakers. These sessions discussed ways to improve..
WaterWorks News, July 2016 American Water Seeks Approval Of Plan in WV West Virginia American Water filed an application with the Public Service Commission of West Virginia (PSC) seeking approval of an Infrastructure Replacement Program (IRP). The purpose of an IRP is to address the national chall.. In the second quarter of 2016, Stantec announced the completion of its acquisition of MWH Global – a 6,800-person engineering, consulting and construction management firm focused on water and natural resources for built infrastructure and the environment. This acquisition expands Stantec’s position ..
A survey published by Circle of Blue – an award-winning network of journalists and researchers, who report on water and worldwide resource issues – reported the price of municipal water in the United States is rising faster than any other city household expense. The network’s annual water rates tra..
Pacific Gas and Electric Company (PG&E) announced its current testing of unmanned aircraft systems (UAS), or drones, to enhance the safety and reliability of its electric and gas services. The Federal Aviation Administration (FAA) authorized PG&E’s use of drones to assist with electric and gas infra..
Pennsylvania American Water, a subsidiary of American Water, announced it reached an agreement to acquire the wastewater assets of the Borough of New Cumberland in Cumberland County, earlier this year. Pennsylvania American Water and the Borough will seek approval of the acquisition from the Pennsy.. The Fort Worth (Texas) Water Department earned a 2016 Texas Environmental Excellence Award – the highest environmental honor in the state – in the category of Innovative Operations/Management for its Interceptor Condition Assessment Program (ICAP), This new technology allows for more effective inspe..
EDITOR’S NOTE: NASSCO just completed its 40th anniversary and continues to set standards for the assessment and rehabilitation of underground infrastructure. As the association continues its phenomenal growth, this series profiles those who have made significant contributions and impacted the cont.. Rehabilitation Technology Business News, July 2016 Aegion Wins $8 Million Contract Aegion Corp. has been awarded an $8 million contract from the city of Montgomery, AL, for its Infrastructure Solutions platform. This project is the second and final phase of a wastewater pipeline rehabilitation pro.. Bypass At Its Best By Hunter Powell Senior Applications Engineer, Southeast Region, Xylem Dewatering The Wastewater Department of the city of Tampa, FL, is responsible for the collection, treatment and disposal of more than 55 million gallons of wastewater per day (mgd) from more than 100,000 cust..
An “Impossible” Project Completed On-Budget, Ahead Of Schedule Many sewer line replacement and rehabilitation projects could be classified “routine” because they are relatively straightforward with few complications. Even so, no two projects are exactly alike, and most have challenges and issues t..
SAK Construction (SAK), a national pipeline rehabilitation and tunneling services contractor, is beginning work on $21.7 million of contracts won throughout the Baltimore, MD, and Washington DC regions. SAK is repairing the sewer and pipeline infrastructure in these metropolitan areas by utilizing s..
McLaughlin is introducing a new utility locator, the Verifier G3, that combines trusted precision with a simple, user-friendly interface. Contractors face congested underground conditions, unmarked utilities and increasingly strict regulations, making accurate, timely locating more important than ev..
New to Borzall’s housing line-up is a 2.5″ diameter housing that is compatible with Borzall’s new line of 3.5″ blades, as well as small OEM blades. Made for mini drills with up to 10,000 lb. thrust, this housing is smaller, shorter, and lighter to make those service bores quick and easy. Manufactur..
As part of its continuing commitment to cutting-edge downhole solutions for the horizontal directional drilling (HDD) industry, Hunting’s Trenchless Division introduces the revolutionary HX-1TRN quick connect. This product requires just a single, 360-degree rotation to fully connect or disconnect tr..
SlatTrax ground protection for skid loaders increases work-crew productivity and provides a professional alternative to plywood and mats. The system includes a hydraulically powered attachment that holds dual spools of Trax, each 36” or 42” wide and up to 100’ in length, and rolls out or retrieves e..
McElroy’s Extruded fintube machine recently outdid prior performances, demonstrating its ability to offer significant savings to fintube manufacturers due to its capacity to produce quality fintubes using less raw material than before. The cost efficiency offering from the company’s Extruded fintub..
Rick Gage, vice president of sales at LMK Technologies, has been named to the board of directors for the Midwest Society for Trenchless Technology (MSTT). The non-profit organization was established in 1998, as a regional chapter of the North American Society for Trenchless Technology, to promote tr..
Fifteen different Melfred Borzall distributorships from around the world attended the 2016 Annual Distributor meeting in Santa Maria, CA for two days of extensive training. Every year Melfred Borzall hosts an in-depth two day training session for their distributors as an opportunity to learn about ..
A South Dakota family had a chance encounter with a pink Felling FT-3 trailer a few years after they lost their own daughter to breast cancer. Intrigued, Gerald and Darlene Dinger took down the number for Felling Trailers with the intention of purchasing their own pink trailer in memory of their dau..
Toro recently announced a new partnership with Florida-based Southern Drill Supply, which will now offer a full line of Toro underground equipment, including directional drills, trenchers, vibratory plows, compact utility loaders and attachments, compactors, rammers and trench rollers. Southern Dri..
West Virginia American Water filed an application with the Public Service Commission of West Virginia (PSC) seeking approval of an Infrastructure Replacement Program (IRP). The purpose of an IRP is to address the national challenge of aging infrastructure by directing additional investment to areas .. The Gas Technology Institute (GTI) celebrates 75 years as a leading research, development and training organization addressing global energy and environmental challenges by developing technology-based solutions for consumers, industry and government. GTI has provided high-impact technologies and te.. The Vermeer S725TX compact utility loader can accommodate a wide range of attachments, including buckets, pallet forks, dirt augers and trenchers. It has a 750-pound, SAE-rated operating capacity; a 2,145-pound tipping capacity; and a 24.8-hp Kubota Tier 4 Final engine. The S725TX is available with .. The Schonstedt XTpc is a single frequency locator. Choose from two pre-set frequencies: 82 kHz or 33 kHz, depending on your need. In general, 82 kHz is useful in tracing gas and as a water line detector, while 33 kHz is a better choice for tracing electrical lines. The XTpc also offers one passive f..
Heath’s intrinsically safe Remote Methane Leak Detector (RMLD-IS) is an eye-safe laser-based natural gas detector (methane) that can quickly and efficiently detect leaks up to one hundred feet away allowing remote detection of difficult to access places such as; busy roadways, locked yards, undergro..
For power in a more compact package consider the Vactor HXX Prodigy vacuum excavation truck. The Vactor HXX Prodigy vacuum excavator is the perfect non-destructive machine for utility and municipal applications. Versatile enough to excavate using either air or water as a digging medium, the HXX Prod.. The Perma-Liner Sectional Lining System is designed for 6- to 60-inch diameter pipelines. The materials are pulled into place through existing manholes and are ambient cured in three hours or heat cured in as little as 1 ½ hours. Installations average 1-5 installations per day. The Perma-Liner Secti..
Grindex Pumps offers a complete line of highly efficient and reliable submersible pumps for drainage and sludge applications ranging from 0.6 to 140 hp. These pumps boast solids handling capability of up to 3.2 inch, capacities of up to 375 feet and 5,000 gpm. Stainless steel options are available. ..
A popular choice with contractors working throughout the coldest regions of North America, the Arctic Supersucker vacuum truck from Super Products LLC makes dependable operation in harsh conditions easier by relying on a design specifically for use in frigid environments. Offering the same performa.. Bit Brokers International’s patent-pending VersaReam, is a bi-directional, expandable/interchangeable blade PDC reamer. With versatility that allows drillers to change the size of their reamer by simply changing blades, VersaReam drills three to five times faster than the traditional roller cone rea.. The Environmental Protection Agency’s (EPA) new rule requiring transmission pipelines to plug methane leaks at compressor stations includes some softening of earlier-proposed requirements, but will still impose substantial costs as companies move to repair leaks at new or modified compressors and co..
by Robert Carpenter Editor-in-Chief For a surprisingly large number of contractors and manufacturers in the infrastructure markets, the first half of 2016 has seen a tepid advance, even with favorable economic winds at their backs. Must be an election year. There are exceptions. The horizontal dir..